A burst of summery colours and flavours! I know most people measure seasons by the weather but my seasons are all about food. I love to cook with whatever is fresh and local and while I’m a little sad when one particular crop is no longer available at the farmers’ market, it’s reassuring to know that for many months, something else equally delicious is coming into season. I spotted the first local corn at the market yesterday and that served as the inspiration for this dish. 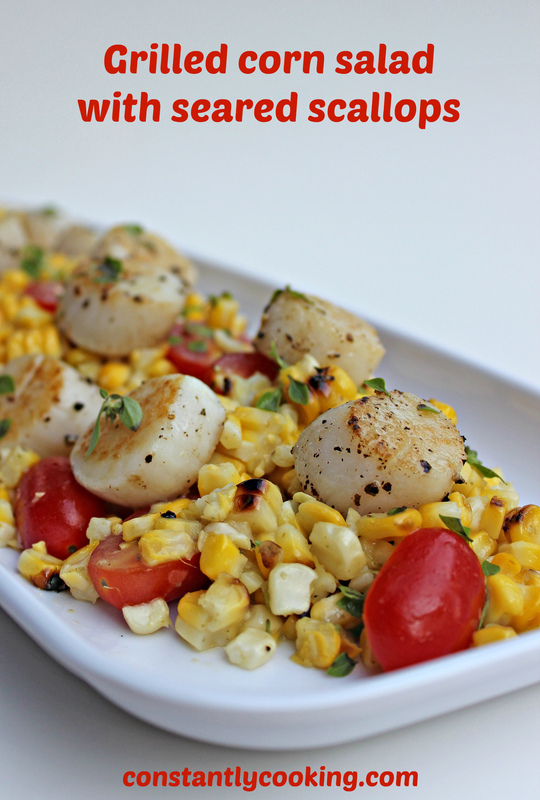 The corn salad is super tasty on its own and would make a great vegan side dish but if you’re into scallops, don’t miss out on this amazing flavour combo. 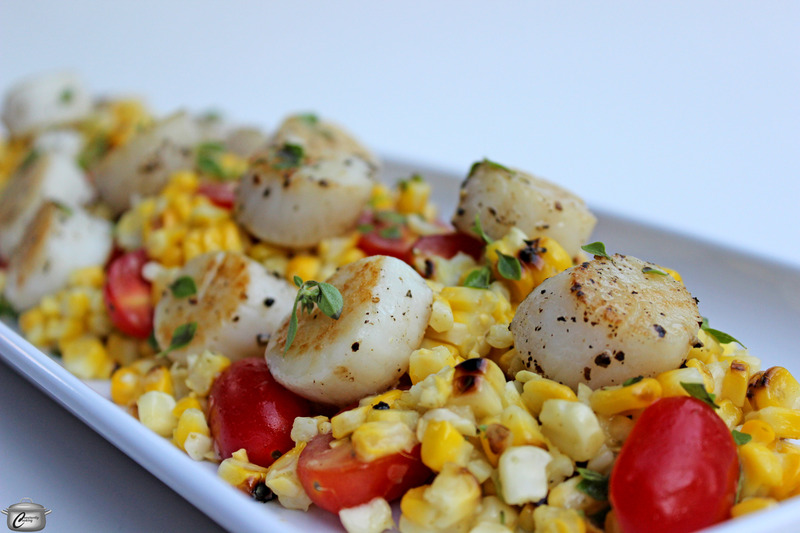 The tangy vinaigrette is a lovely counterpoint to the sweet corn and scallops; I made a full recipe and my husband and I ate the whole thing in one sitting. If you’re a fan of grilled corn you might also love this grilled corn, zucchini and carrot salad with lime vinaigrette or this tasty grilled corn and tomatillo salsa. Preheat barbeque to medium. Remove husks and silk from corn cobs. Brush lightly with 1 tablespoon (15 mL) of the olive oil then grill for about 15 minutes, turning often, until kernels are tender and very lightly charred. Let corn cool for a few minutes then use a sharp knife or corn stripper to remove kernels from the cobs and transfer to a medium-sized bowl. Add the halved tomatoes and green onions to the bowl and sprinkle with salt and pepper. The undressed corn salad can be covered and kept at room temperature for up to 8 hours. In a blender, puree the shallot and capers with the vinegar, hot water and Dijon. With the blender running, slowly add 6 tablespoons (90 mL) of the olive oil until combined. Season the vinaigrette with salt and pepper to taste, then drizzle over the corn salad. Add shredded basil leaves and toss gently. Heat remaining tablespoon (15 mL) of oil in a large frying pan (cast iron is best) over medium-high heat and add just as many scallops as will fit in a single layer without crowding (you may need to cook in two batches depending upon the size of your pan). Cook for 2 minutes then flip and cook 2 minutes more. Remove to a warm plate and repeat with remaining scallops. Divide corn salad among four serving plates. Top with cooked scallops and serve immediately. Serves 4 as a main course or more as an appetizer. This entry was posted in dinner, fish, Salads and tagged basil, capers, corn on the cob, gluten-free, grape tomatoes, grilled corn, make-ahead, pan-seared, Paula Roy, pescatarian, scallops, seafood, seared scallops, summery salad, vegan, vegetables, vegetarian, vinaigrette, what to make with fresh corn. Bookmark the permalink. Delicious – wouldn’t change a thing! I loved using the tomatoes and basil from my garden – next year I’ll plant green onions! So glad you enjoyed it and yes, a great way to use hyper-local (aka home grown) ingredients!